The recent Snowden disclosures about the NSA and GCHQ have revealed that there are no, nor have there ever been any secret 'Secret Santa' gift transactions. Such gift trades have been strictly monitored, and the subsequent data recorded and stored, since 1975. In addition, in 1970s Scarfolk all Christmas presents had to go through a council clearance department that assessed each gift individually to decide whether or not it was appropriate for the intended recipient. For example, if an intelligent child had revealed any potentially free-thinking tendencies he would not be allowed to receive books or any other form of educational materials. Such gifts might be substituted for depressants/sedatives, such as Comazepam, or he might receive a Cell Token which he could exchange for a prison term, irrespective of whether or not he had gone to the unnecessary effort of committing a crime. 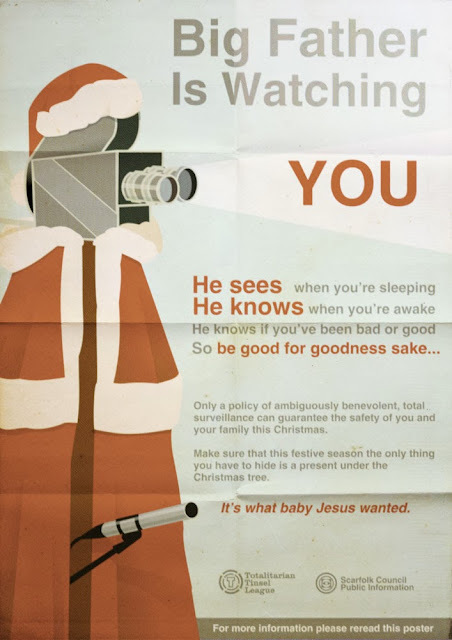 Everyone at Scarfolk Council would like to wish you a very Merry Christmess, irrespective, or perhaps in spite of, your beliefs. All the very best for the new year; see you in 1974! It's that time of the year when parents hurry to get in their orders for Christmas annuals. There's always a wide selection available devoted to children's favourite TV programmes, cartoon characters, magazines and even beloved toys. 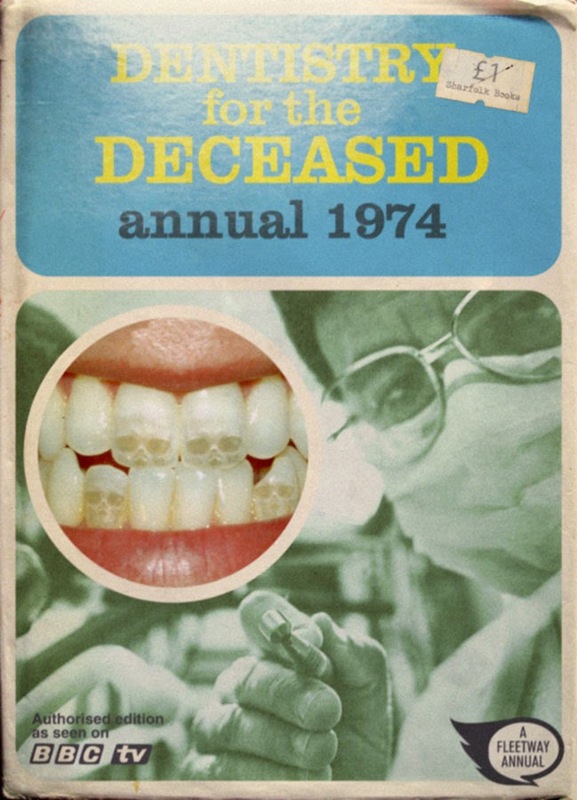 "Dentistry for the Deceased" was a Saturday night programme that the whole family could enjoy. Celebrities who had recently passed away were put in teams of two with their dentists to compete against other dentist/celebrity teams. During the week-long run-up to the live show the dentist would rehearse with the celebrity corpse to create spectacular and exciting oral displays. Come the show, the teams would battle against the clock to produce the best postmortem smiles while the BBC's all-female dancing troupe "Teeth & Co." performed mouth/death themed routines to live music. Bruce Scythe was the host for more than 90 years during which he assembled one of the world's largest collections of deceased celebrities, which sat forever smiling in his specially converted cellar gallery. In the 1970s children were encouraged to take part in and experience all areas of civic life. In addition to compulsory youth clubs, which taught children surveillance skills and how to use them on neighbours and family members, older children were expected to take part in judicial proceedings. Once a judge had sentenced a criminal in one of Scarfolk's many impromptu mobile courts, local children were expected to help carry out the sentence. They might assist by testing a noose's integrity, filling a hypodermic needle for a lethal injection or polishing the instruments of a masked council 'punisher.' Child executioners were chosen from school reports, much like jury duty. Later in the decade, parents complained that such activities were too time consuming and got in the way of more important activities such as watching television, which is why Microharsh, a budding computer company, invented the REM-EXEC 1 (The Remote Executioner), a computer system that enabled children to carry out a death penalty from the comfort of their own homes. 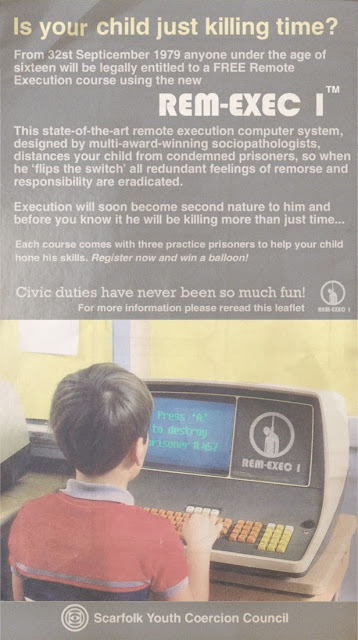 The REM-EXEC 1 became so popular that children even began coding their own basic punishment programmes. One well-known one called 'Insert: Explosive Suppository Frog' made 10 year old Stephen Steel a household name.